Sweet Wishes in all your Creations! 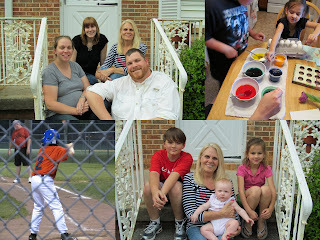 Fun & Functional blog: to keep in touch with friends, family, and fellow crafters. Click here, and then click on Shop Now to order online. The last 12 months in (about) 1500 words...plus pictures. 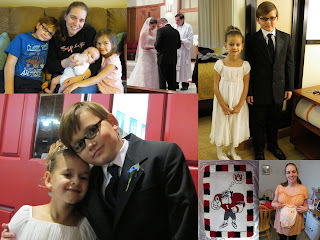 November 2011– I spent the first two weeks getting my students ready for their Christmas program, having a last minute Stampin’ Up! workshop, traveling to GA for a Women of the ELCA (W-ELCA) board meeting (and getting to sneak away to see my new niece), packing, and saying good bye to co-workers, students, and the members of St. James Lutheran Church. 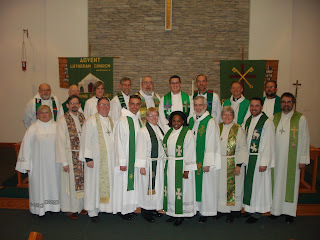 The weekend before Thanksgiving, we moved to Murfreesboro, TN so that Michael could begin serving as pastor at Advent Lutheran Church. We celebrated Thanksgiving with the Hawkins, a family in our new congregation that we have been friends with for several years. And Michael’s first Sunday at Advent was the first Sunday of Advent. December 2011– We got the kids settled into their new school, just in time for Christmas break. The kids both participated in Advent’s Christmas play followed by the Murfreesboro Christmas Parade. I traveled back to Greeneville to direct my former students in their Christmas program. We found out we were expecting our third child! We went swimming at an indoor pool here in the Boro. We experienced Opryland Hotel all decked out for Christmas. Our Advent, Christmas Eve, and Christmas Day worship services were all lovely. And my mom and step-dad came up on Christmas Day and stayed for a few days. 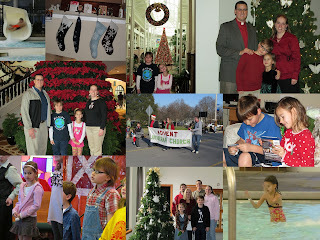 January 2012– We left on New Year’s Day to drive down to Atlanta to finally celebrate Christmas with the rest of our Family. On Jan. 2, we drove a few more hours south to Leesburg, GA to visit my new niece, Cassidy, and Lindsey and Wes; while we were there with the baby, we told AJ and DJ that we’d be having a baby of our own. They were SUPER excited! Then we spent the rest of the week visiting with family members and friends and getting ready for Michael’s brother’s wedding. I made the groom’s cake for the rehearsal dinner, and the kids were both in the wedding. I had my first OB appointment. We checked out the Discovery Center, a hands-on museum, here in the Boro. And AJ turned 6! February – Back to Atl for me, for another W-ELCA board meeting, and then sling-shot back home for Michael’s official installation as the pastor of Advent. It was a fabulous service, which included the children of the church singing “Welcome to the Family,” followed by an equally fabulous reception. The next day I began babysitting for two lovely little girls from our church. And DJ turned 9! March – Not a very eventful month. 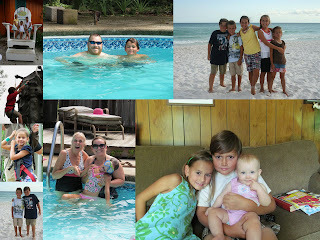 We laid low during spring break, but got to visit the Nashville Zoo and hang out at the Hawkins’ cabin. Then we closed the month out with our first ultrasound on the 30th, and Michael and I celebrated our 11th anniversary on the 31st. April – DJ began what may have been his last baseball season…he did not enjoy the game much this year. My mom and step-dad came to visit for a few days during their spring break. We celebrated Holy week and Easter Sunday with worship, an egg hunt, and an Easter breakfast. The kids and I traveled to Atl to surprise my mom for her 60th birthday. We began house hunting and put an offer in on a house. 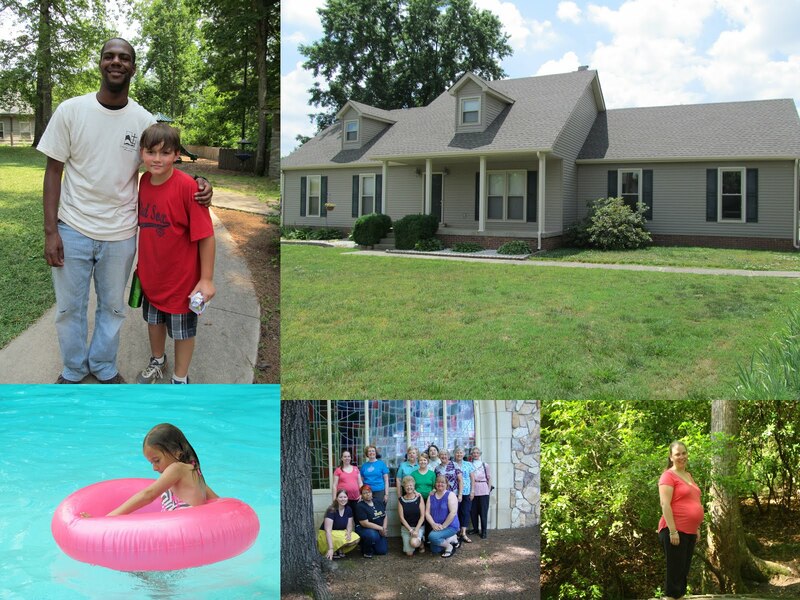 May – We had a second ultrasound; later that day we had our home and termite inspections done on the house we had under contract, and we met with our mortgage officer. I had a happy Mother's Day. I traveled to GA once again for a W-ELCA board meeting…this time at Callaway Gardens. 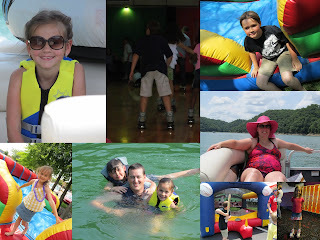 AJ finished up Kindergarten and DJ 3rd grade with an end-of-the-year skate night. We celebrated the first day of summer break at Chick-fil-A. And we spent Memorial Day weekend at the Hawkins’ cabin. 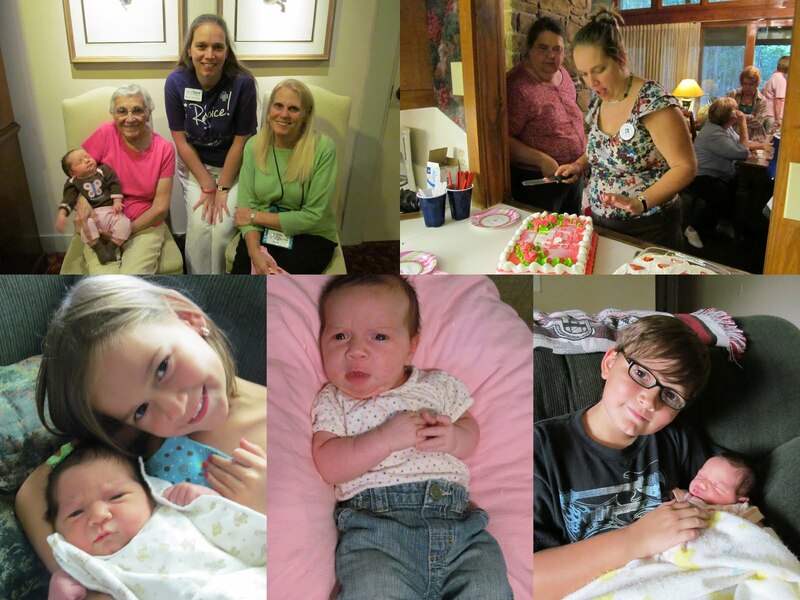 June – Craziest month yet! The Southeastern Synod Assembly, an annual business meeting of pastors and lay members, was the 1st-3rd. We closed on our new house on the 8th and moved in on the 9th. On the 15th, Michael headed to GA for AFFIRM, our Southeastern Synod Youth Gathering (where we met 20 years ago! ), and on the 16th, AJ and I took DJ to camp at Lutheridge in Asheville, NC. After a girls-only week, we met up with Michael in Chattanooga on the 22nd; back to Asheville to pick DJ up from camp on the 23rd. We had our VBS kick-off on the 24th, and I lead crafts for VBS the 25th-29th. 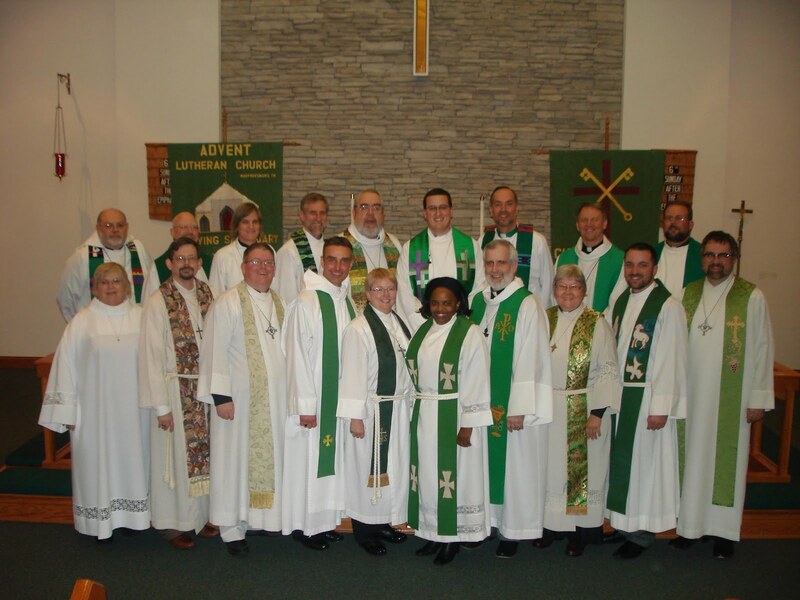 The 30th was the anniversary of Michael’s ordination…5 years; he had been recognized at the Synod Assembly. July – Possibly crazier than June!! Grandaddy and Gram (my dad and step-mom) came to visit for the 4th of July and took DJ and AJ back to GA with them. Michael’s parents took the kids with the rest of his family (20 people total) to the beach for a week the 7th-14th. The 17th was my last official day of babysitting; Michael headed to New Orleans for the ELCA Youth Gathering; the kids had an adventurous day at Stone Mountain; I drove down to Atl for a little R and R. On the 20th my mom (Nana), the kids, and I traveled further south to have lunch with my sister, BIL, and niece, and then spent the weekend with my brother and SIL at their new house enjoying their pool. Back up to Atl on the 22nd, and then back home with Nana in tow on the 24th. Thank God for my mom! She helped us get a little more unpacked, settled in, and prepared for the baby. August – We registered the kids at their new school on the 1st, and they had a “1/2 day” on the 8th. Their first full day of school was the 10th; came home with lots of new neighborhood friends! The ladies of Advent held a beautiful shower for Baby J on the 11th. The van had been in a little accident (not our fault) on Aug. 3rd, so it was at the dealership getting repaired the 13th-20th. Uncle Thomas, Michael’s younger brother, came up on the 17th, to do some contract work with our church youth group, and to help out should the baby make his/her appearance. Also, some friends from our internship church in PA, the Hawks, came through town on the 17th and 18th. After having Mexican food for lunch (my choice), I started having some fairly strong contractions, and at 11pm we checked into the hospital. 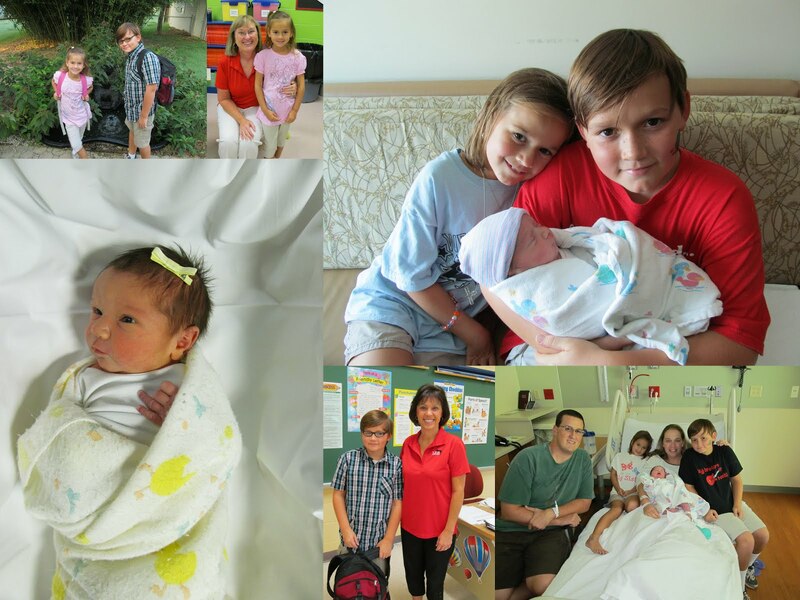 At 10:10am, Sunday, August 19, our daughter, “SJ”, was born. She weighed in at 9 lbs, 3 oz, and was 21” long! Thomas was a great help during that first week. He left on the 24th, and then my mom, step-dad, sister, and niece came that weekend. Nana stayed through the 31st. September – Michael’s parents, Thomas, and my SIL, Teresa, came up for Labor Day weekend. Grandaddy and Gram came up the 8th and 9th. The 13th-16th, SJ and I were back down at Callaway Gardens for the Southeastern Synod W-ELCA Convention, where they surprised me with a little shower. Nana came on the 14th to help out, and Granny, (my grandmother) got to see SJ for a little bit that evening. AJ is looking forward to starting Daisy Girl Scouts sometime soon, and DJ began his first year as a WEBLO in Boy Scouts. SJ was up to 11 lbs, 8 oz at one month, and on the 22nd we had our first family portraits taken. DJ and AJ have adjusted remarkably to being big siblings; they are both such good helpers! October – We spent fall break (Sept 28-Oct 5) down in Atl showing SJ off to family and friends. DJ made all As and Bs (only 1 B) on his first 4th grade report card, and AJ’s teacher had nothing but praise for her at the parent/teacher conference. On the 13th the girls went down to Huntsville for my step-sister’s baby shower. At 2 months, SJ was 12 lbs, 14 oz, and 24”. 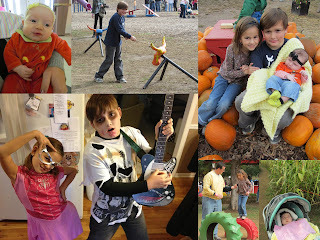 On the 20th we visited Lucky Ladd Farm’s pumpkin patch and corn maze. Our church had a Halloween carnival and trunk-or-treat on the 27th. And DJ and AJ both had fun trick-or-treating on Halloween, despite AJ’s coming down with strep throat two weeks after big brother had it. Life has settled down already. SJ is such a little blessing. I was so worried about having three kids, because there were so many times during my pregnancy when I thought, “I can’t deal with my two kids; how in the WORLD will I be able to handle three?!?! ?” But she is such a good baby, and our family feels much more complete with her in it. Even if you lose sight of me throughout the year, you can sort of count on the fact I'll surface again in October. PLEASE help fight for freedom from cancer. 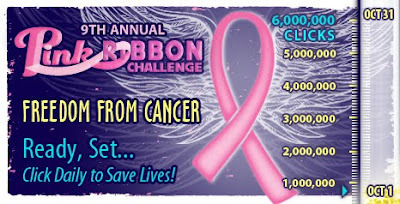 Click the pink button at thebreastcancersite every day! Also, remember to "think pink" this month to help spread awareness. And finally, ladies, remember to do your monthly BSE! March 16, was my grandmother's 80th birthday; my dad's mom, Mama Williams. Here is the card I sent her. The bow was sitting on my desk, and the stamp set was a Sale-A-Bration set that I had recently received. The idea just fell into place with those two pieces of inspiration. Today Michael, the kids and I went over to the Camp Creek/Horse Creek area to help with some of the disaster relief efforts from the devastating storms that came through our area on April 27. A sampling of what we passed along the way to the site where we were assigned, by FEMA, to help. On the property. Fortunately, no one lived in this trailer, and no one in the immediate vicinity was killed. Five homes surrounding the property were completely destroyed, and not all of them were mobile homes. The kids and I picked up LOTS of trash. DJ helped haul tree limbs too. Michael and another volunteer hauling a tub. Three other ladies hauling another tub. AJ & DJ were fascinated by the burning brush pile! After three hours of hard work, we were ALL exhausted. When we first arrived at the FEMA site, DJ asked, "Are we getting paid to do this?" To which I responded, "No, we're volunteers." He then clarified, "No, I mean are you and Daddy going to give us chore money?" I went into a further explanation of what it means to be a volunteer and how we were helping people and such. He seemed to understand. Later, while we were working at the property AJ told Michael, "This is actually lots of fun...until you get hot. Then it isn't fun anymore." All in all, we enjoyed ourselves and are glad we were able to help out in our neighboring community. We did go out for ice cream after we came home and got cleaned up. It was a great day! These projects are from the last of a series of classes I did as part of a Big Shot club. The featured dies were the Scallop Circle and the Scallop Circle #2 bigz dies. My friend Beth, who no longer blogs, made some of these ADORABLE boxes, so I stole the idea from her, though it was not originally her own either. For the lid, we also used the Flower, Dasies #2 bigz die. I promise I will come back later and give you a link to the instructions for making these adorable things! Then here is this too-stinkin'-cute card we made too. I had seen these all over blogland and SCS. I can't tell you who the original thinker-uper was for the idea, but I'm pretty sure I got the most help from Patty Bennett's blog. We did one other card, I think, but I haven't got a picture of it. I made this as a gift for my one customer who subscribed to the club that month. It's a note pad. ps. I think this is my last day of catch-up...I'll have to find some more projects to post! I edited my post from yesterday to include the links to the cards I CASEd. I don't actually remember when we made this card. It might have been one I demonstrated or that we made at the new catalog open house in July 2009. But I can't find the original idea for it, and I looked through all my files on both my desktop and laptop computers. I even went so far as to look in the old Stampin' Success and Idea Book & Catalog...no luck. I know I copied someone's cute creation, so if this idea was yours, thank you, and I'm sorry I can't give you proper credit. The next two projects are from a workshop I did using the A Rose is a Rose stamp set. I simplified this card for the first project. The second project was this darling cello' bag topper. There was a third project, but I didn't get a picture of it, and I don't even remember what it looked like. I'm sure it was another 6x6 page/3x6 card option. Oh well. I think these projects were from workshops I did in summer 2009. This first picture is of the hostess gifts I made. I wanted to feature the then new In Colors, lace boarder punch, and Circle Circus stamp set. The packaging was my own idea. I think I CASEd the idea for these cards, but it's been so long, I have NO idea who I copied. Sorry. ETA: I found the original idea. It was from "stamptilucramp" over on SCS. I took her idea and made a set of 4 cards. I will have to look back and get the links for all these projects because I know this next one was not original either. I can't remember the name of the technique, but you punch your shape, paper pierce around it, and layer the DSP behind the "window." ETA: the name of the technique is reverse punch applique, and here is the card I CASEd. This *might* have been my own idea. The workshop guests had the choice of making a 6x6 scrapbook page or a 3x6 card. ETA: Nope. I actually combined a few ideas I saw, but here is the one that is closest to my final product. This fun little pouch uses the Razzle Dazzle stamp set. It's got M&Ms inside. Yum! I stamped and punched the oval sentiments ahead of time. Wasn't that nice of me? ;-) ETA: I could not find the original idea for this project. Could it be my own? Doubtful, but possible. This year is St. James Lutheran Church's 200th anniversary. Michael and the bicentennial committee have been planning the celebration for the past 3 years. There are several events that have already taken place and more to come. On Palm Sunday weekend, the Berea College Concert Choir and Chamber Singers came to give a concert and lead music during worship. They were amazing and a very fun group of young men and women. Here's AJ before her Pre-K class' Easter Egg hunt. They had to find eggs numbered 1-10 in numerical order, so it was a fun learning activity. On Good Friday, Michael and the kids and I traveled up to Johnson City and delivered a few Easter goodies to the residents of the Ronald McDonald House. My lovely family on Easter Sunday. The Lord is RISEN! Alleluia!!!!! AJ LOVES to wear dresses. She asks all the time to wear a dress to school. Unfortunately, I didn't feel like any of the dresses she had would be okay to wear to school (No paint on our Sunday best, please!). So we finally found one at Walmart that I felt could work. There were actually two she liked, so I bought her one, and she used the money she got from family for Easter to buy the other one. DJ participated in field day. The way they do it here in Greene County is that all the 1st-8th graders at all the county and city schools have try-outs at their individual school, and then each school sends one person to compete in each event at each level. DJ was chosen to represent our school in the 1st & 2nd grade boys standing broad jump. He won first place!!!!!!!!!!!!!!!!!!!!!!!!!!!!!!!!!! So proud! This past Sunday was my little brother's birthday, and then yesterday was his wife's. I typically try to make them coordinating cards...at least using the same stamp set (click here to see their cards from two years ago). This year was no different. I used the Take A Spin stamp set that was in the Occasions Mini Catalog. I'm really hoping this set makes it into the 2011-2012 IB&C (which comes out in July). I CASEd Brett's card from jrmccue's card here. And I think the original idea for Kelly's card came from a Stampin' Success issue, but I took my inspiration from Emily's card. I left Brett's spinner loose so that it could be spun, but the image on Kelly's card has various different holidays, and I wanted it to only be a birthday card, so in addition to stamping that part of the image in a different color, I also attached the spinner tighter so it would only point to birthday. When I mentioned the other day that I had taken a break from all things Stampin' Up! I wasn't lying. I hadn't done anything business related since October. However, I did stamp. In the past month-and-a-half we had three showers at school. Two wedding and a baby. I stamped invitations for all three, and gave the bride/mommy-to-be a set of thank you cards as a gift. I am on the committee that coordinates the showers, so I tried to have the invitations and cards match the decor as much as possible. This is an OLD set called Terrific Tulips. Kalyn's colors are tangerine and lime, so I used Tangerine Tango and the retired Green Galore. We decorated with tangelos and limes in tall skinny vases. Carling's colors are Monterrey blue and coral, and her bride's maids are carrying yellow flowers. "Monterrey blue" is NOT a Stampin' Up! color, so I had a really difficult time with this one! I ended up going with Pacific Point, (which the mother-of-the-bride said was almost a perfect match), Cameo Coral, and Daffodil Delight for the invitations. The only party plates and napkins that I could find that even came close were some Hawaiian luau things. So for the thank yous I went with Bermuda Bay, which matched the decor (and the cake I made) better. The napkins I found for the baby shower had the profile of a pregnant lady from the neck to the bottom of her belly under a cute polka-dotted umbrella. So I decided to go with a polka-dot theme. I used the same dot along with the baby rattle handle for the thank yous. The dot and handle are from the set Playful Pieces which is a current level 3 hostess set. Host a qualifying workshop before June 30 to earn this awesome set FREE! Yesterday was a busy day in the life of St. James Lutheran Church. We recognized our 2011 graduates, celebrated the Affirmation of Baptism (Confirmation) for four of our youth, and had a play to commerate our 200th anniversary. There was also a Confirmation luncheon and reception after the play, so it was a very full day. I had volunteered Michael and myself to take care of getting the gifts for the confirmands, and while Michael was calling me from the Christian book store up in Johnson City the other day, listing several ideas he saw as he walked through the isles, I told him to go out of the store, walk next door to the craft store and get me the supplies to make their gifts. I had purchased the frames previously, so all he had to buy were the wooden crosses. I am thrilled with how they turned out. I made a turquoise one as well, but didn't get a picture of it. Then I had to package them accordingly, and yes, there were matching cards, but I didn't get a picture of them. I have a few passions in my life other than my family, my friends, and my faith. Most of them involve creating: stamping, scrapbooking, card making, and cake decorating. I chose the saying, “Sweet wishes in all your creations!” as my signature line a few years ago because it is a closing that incorporates all my fellow stampers, scrapbookers, card makers, and cake decorators. So I truly wish you much sweetness in all your creations! 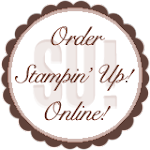 All artwork is ©Stampin' Up! 1990-2011 (unless otherwise noted). All content, including text, photographs and design work is meant to inspire creativity and may not be submitted as your own. Thank you for your understanding!